What I like: Randomized and optionally hidden tech tree. Different take on city management. Very stable and quick AI turn times. Not So Much: Poor manual only contains lore. Some features are a little light. The Verdict: A solid entry into the 4X genre. While there is room for improvement this is a very good first version which can be enjoyed right out of the box. I hope the developers take it even further! Disclaimer: This review is based on a free review copy provided by Slitherine / Matrix Games. Once upon a time, in a land far, far away, there was a game called Alpha Centauri. Lots of people loved Alpha Centauri and Firaxis was happy. I haven't played it in well over a decade and don't remember the details of the game so this is where Alpha Centauri's appearance ends, other than being an inspiration for Pandora: First Contact. For those of you who don't reside in the Milky Way (Hey, nothing ever disappears on the internet. There may be readers outside the Milky Way in another 1000 years! ), Pandora is a 4X game set on an alien planet. It plays similarly to a game like Civilization and contains most of the usual 4X trappings, while adding a couple new twists of its own. Well normally I would say read the manual to start off, but since the manual only contains lore I would say you are free to skip it. I did. In general, I don't feel the need to read the lore about a game. Sometimes I read the flavor text within games, but I want to play the game. I wouldn't object to the lore being in the manual if the manual actually contained the instructions on how to play the game, but it doesn't. There are some helpful hint messages that pop up when encountering new aspects of the game and tooltips that go a long way to peer into the mechanics of the game, but they aren't enough to answer all questions. Pandora contains the basic options one would expect when starting up a 4X game - world size, land formations, difficulty, pace of research and production, along with a couple more, but they are a little on the light side. There are only three types of maps - pangea, continents, and archipelago. There are 6 factions to choose from and no ability to create a custom faction. Each faction does feel different due to some pretty substantial bonuses, which somewhat steer the player towards a particular play style. This isn't to say you are completely locked into playing a specific way, but there isn't as much flexibility as with Civilization. While the bonuses do differentiate the factions pretty well, there aren't the other trappings players of Civilization have come to expect, like faction specific buildings and units. Note: The game does provide simultaneous turn multiplayer, but this is only a review of the single-player aspect. The following should be familiar to any player of 4X games. Each faction starts on a shrouded map, ready to place their first city. It's so familiar I think I may have typed the exact sentence in a previous review. Pandora puts a twist on the tried and true Civilization model of city management and the economic game. Instead of assigning people to one of the city's surrounding terrain tiles, they are actually assigned roles. Farmers and miners work the land to generate food and minerals. When a person is assigned to be a farmer or miner, they automatically work the most productive portion of a terrain tile that pertains to their job, since a tile is capable of yielding food and minerals. Food and minerals are placed in the faction's stockpile to be used by any of its cities. This really makes sense for a space age game since one city should be able to ship resources to another city. Cities don't increase in population by accumulating excess food. There is a natural growth factor. As the city's population grows, so does the growth rate. This is logical because when there are more people, there are more people making babies. For those people to survive, you must be generating enough food to feed them, or have enough in the stockpile to draw from. This feels more natural then the excess food method of growth and I rather like it. I do wish there were other factors that affected a city's growth rate, as this is a little too simplified. When people are assigned the worker role, they generate production used to produce units and buildings. Each unit of production needs 1 mineral; otherwise the production capacity is decreased. 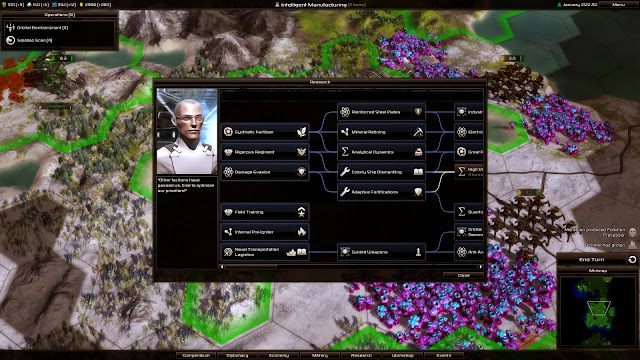 People assigned to the scientist role generate research to give access to more advanced buildings, units, and more. Would the toolbox of any planetary ruler be complete without a slider to adjust the tax rate? I think not! Setting a higher tax rate generates more credits, but at the expense of the city's morale. Credits can be used to speed up production, pay for building and troop maintenance, and grease the palms of other rulers' to buy their friendship. Now all these workers doing their thing generate pollution; workers the most and scientists the least. Pollution makes people unhappy and reduces the city's morale. Not having enough housing also makes people a bit cranky. Morale has an effect on the productivity of the city's workers, so you don't want them to be unhappy for too long. One cool thing about morale is that your people will automatically migrate from cities of lower morale to those with higher morale. I've never really had to pay too much attention to it as something to manage, but it is cool nonetheless. All of this is pretty easy to understand due to the tooltips, but I'm sure a manual would be of use to many people trying to learn the game. One aspect of Pandora that falls a little short is the terrain tiles. While there are some special locations that give different bonuses, there aren't any special resources to get excited about. One of the fun things in Civ is to find a source of a special resource. Pandora doesn't have any luxury resources or strategic resources. For those who don't know, strategic resources are needed to build certain units in Civilization. This makes acquiring enough of a supply a high priority and fuels the desire to trade and make war. Luxury resources are used to boost the mood of your peoples. Pandora feels a little flat in this regard since it doesn't have either, or something else to pick up the slack. So the scientists are busy at work generating research and not before long they will discover one of the 100+ technologies. Researching a technology unlocks things that make your faction better in some regard - new buildings to construct in your cities, types of military units along with components to equip them with, general perks that immediately help your faction, and best of all ... operations. There are three features that make the Pandora tech tree stand out from many other strategy games. The locations of the techs in the tech tree are randomized, so the player doesn't always research the same techs in the same order. This presents fresh decisions each game instead of falling into the same pattern. Secondly, the visibility of the technologies can be limited to 0-3 techs beyond the ones currently available for research. This adds an element of surprise and discovery to every game. You just don't know what technology will be revealed further down the tree when you discover a new one. This forces the player to adapt somewhat the hand he is dealt. There is still some opportunity for planning depending on the option controlling how many techs get revealed. For those not feeling that adventurous, the entire tech tree can be revealed right from the start, but I think that would take a lot away from the game. The third feature is a little more subtle. There are multiple paths through much of the tech tree, so some techs can be bypassed entirely. Discovery could lead deep down one path without expanding another. This leads to interesting decisions about whether to try and make a beeline for more powerful technologies, which may take a while, or discovering the closer ones that provide a more immediate effect. There is a drawback to this randomization; the techs don't always progress logically through the tree - satellite reconnaissance leading to better recycling? It is a small price to pay for a set of features that adds much to the game. Most of the technologies feel pretty typical for a 4X game, but where Pandora hits a home run is with the operations. Discovering an operation technology either unlocks a building or item that can be constructed. Once the building is built, its operations automatically generate every 'x' number of turns. Item-based operations are generated each time one of the cities produces the corresponding item. Operations are one of the highlights of the game and range from reconnaissance, unit repair, long range troop deployment and more. By 'and more' I mean some incredibly destructive weapons. Once acquired, select the operation, the target and watch the results. I've seen the AI use some of the operations, but not others, and not with the frequency I use them. There is one operation that allows troop training, making them more effective in combat. It comes early in the game and performing it multiple times on a stack of troops really can boost their strength. I use them a lot, but I haven't noticed enemy troops with a very high level of training. Its liberal use should be a no brainer. Some people may view this as a plus, but I think the pace of research is too fast. Even during the end game it isn't unusual to research a new tech every 1-4 turns. This can be tweaked with the pace setting, but that also affects production speed. Separate settings would be appreciated. What 4X game would be complete without the ability to build structures in your city to give various aspects a boost? If I counted right, Pandora has 36 such buildings. Most of them improve one aspect of the city's performance - troop strength, mining, farming, living quarters, pollution, research, production, morale, and tax income. They come in flavors of increasing strength as research progresses further down the tech tree. They are useful, but not too exciting. The lack of 'wonder buildings', like in Civilization, is sorely missed. The race to build my favorite wonders is one of my favorite parts of games like this. It is hard not to compare 4X games to Civilization. A 4X game isn't complete without some military conflict. In the early and even the mid game, the native life forms can be a threat. Of course there are the other human factions, who if not mollified can be a thorn in your side. Depending on the setting, the alien life forms may remain peaceful for a while or want to show you the door in a hurry. Units are made up of 4 parts - the base class, weapon, armor and device. The class defines the base capabilities of the unit - infantry, tank, mech, boat, and plane. Weapons can only be equipped on particular types of units and may be tailored to combat certain unit types more effectively, or have some other perk to them - such as splash damage. Armor adds to the overall strength of the unit, making them more effective in most situations. Devices also modify the abilities of the unit giving them perks such as being more effective on offense or defense, able to see farther, attack multiple times per turn, and more. It combines into something a somewhat more complex than the typical rock, paper scissor system found in most 4X games. You won't get very far if you don't design your own units since the default ones are bare boned. Luckily it is a simple system to use and new designs can be created in less than a minute. I'm not a big fan of unit customization in general, but I didn't find this implementation too cumbersome. The unit workshop could be improved if it allowed the player to specify 'best available' for each option to reduce the amount of unit redesign as techs are discovered. Units are rated for power (how effective they are at causing damage), speed (tile movement per turn), sight (how many tiles they can see), health (their current condition), and rank (combat experience). While units can be stacked (yea! ), combat occurs between two units. This can make for some lengthy battles when besieging a highly defended city, but it is better than Civ V's 1 unit per tile limitation in my opinion. Stacks are susceptible to splash damage attacks, so that is something to consider before putting all of your eggs in one basket. Pandora is lacking an interesting unit promotion system. As units gain rank, they are more effective in combat but don't acquire any special perks that can help make them unique. The AI is capable of launching dangerous attacks on the player. It took me 4 games at the default difficulty setting before I achieved my first victory as I was wiped off the map in 2 of my first 3 games. Even after I got the hang of the game the AI would threaten and sometimes capture my cities. While it certainly performs better than the Civ V AI in terms of combat, it does sometimes attack a city with forces that don't have a lot of hope of winning. The AI also tends to keep a lot of the early game units without upgrading them. So there are some areas for improvement to up the challenge for the human player. The AI also can become predictable with their attacks, repeatedly going for the same city or two. A helpful combat window is displayed to show the applicable modifiers, along with the suspected victor and casualties inflicted. Diplomacy isn't horrible, but it is perhaps the weakest area of Pandora. The standard diplomatic options exist - non aggression pacts, map trades, economic and research treaties, alliances and declaring war. Greasing a faction leader's palm with some credits may buy some friendship for a while. Some factions are more predisposed to combat than others. It seems like the religious fanatics are the most trigger happy, followed by the militaristic one. With some effort you can keep almost everyone happy with you, but at the cost of how many credits? Factions will also demand tributes if they feel they have the upper hand, or offer gifts when they want to cement their friendship. There is also the cheaper option of just praising another faction to try and boost your friendship. It all feels very Civ Vish. While it is easy to see who likes you and who doesn't, it isn't clear as to why they do. I have no idea if close proximity affects the likelihood for hostilities or what factors are involved. The factions generally don't behave too crazily, flipping from friendly to aggressive, but there was a little of that. After having a long time friendship with a faction, I decided the time had come for their land to become mine. I terminated my agreements and waged war. This didn't seem to have an effect on my relations with any other factions. It seems like if a faction attacks another faction that they are still friendly with, other factions should deem them less trustworthy. Then you can decide to take more time decreasing your relations by using the renounce feature so relations with your other friends aren't harmed, or attack quickly but at the cost of being viewed as deceitful. It would also be nice if resource trading between factions was allowed, giving another motivation to have non-hostile relations. So while Proxy Studios dropped the ball on the manual, they slam dunked the user interface. The main screen is uncluttered; important information is typically clearly displayed, events of interest each turn are displayed on the right and jumping to their source is just a click away. Research, production, and unit movement reminders are displayed prominently adjacent to the next turn button. Tooltips fill in most of the blanks. An economy window provides a sortable list of cities which can be managed right from the list. The diplomacy screen shows your relations with all of the discovered factions, the relative strength of each pertaining to their economy, military, research and diplomacy. My one complaint about the diplomacy screen is that the criteria used to judge the factions in each category aren't explained at all. I attacked and trounced factions that were ranked stronger than me militarily, so I think the rankings may heavily weigh quantity over quality. The criteria for the other categories aren't obvious either. The progress for the victory conditions is hidden away as tooltips for the corresponding tabs at the bottom of the screen. It took me a while before I stumbled across that. 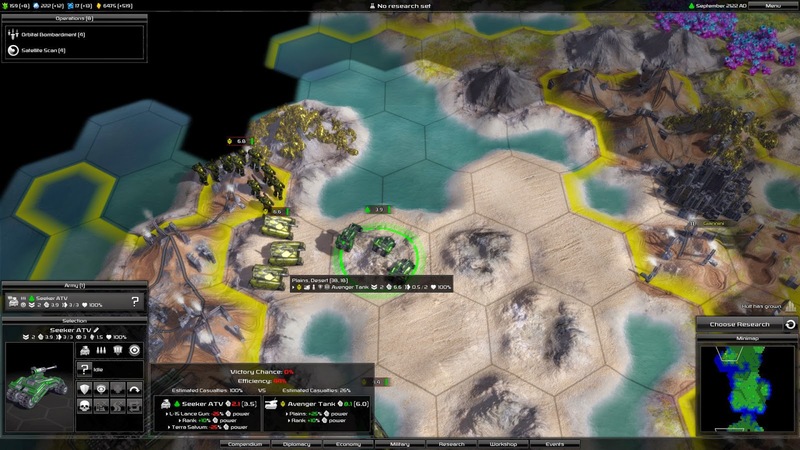 The game does provide some popup messages for big events, such as a faction discovering nuclear weapons and black hole generators, or getting close to victory. Unfortunately for me it wasn't clear what the impending victory messages meant until I lost. Now that I know what they mean it isn't a problem. 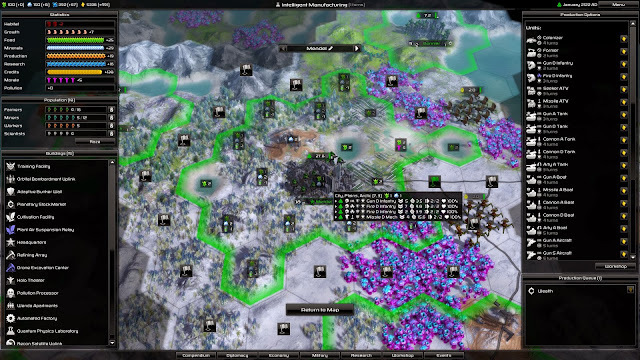 The UI could also be improved by allowing the reordering of the build queues in each city. As it stands, to add an item to the beginning of the queue one must remove all of the existing items and then add the new item. The graphics are good, but at the zoom level one is likely to play at some of the detail is lost. Zoomed in it is easy to see what type of weapon a trooper is carrying, but less so when zoomed out. The UI just gives it a clean crisp look that does its job and is pleasant to look at. I have no complaints. The music was kind of forgettable to me, but this really isn't a drawback for me. It wasn't obnoxious or anything, just neutral. Really good music is more of a bonus than a requirement. I've already mentioned the AI several times throughout the review, but I'll sum it up here. The default difficulty AI easily provides a challenge when learning the game and can be given more bonuses as your skill increases. It can put together successful attacks, but sometimes doesn't bring enough force. It does mix up its forces to some extend too. I don't think it quite knows how to take full advantage of some of the operations. City development seems reasonable, but they will squeeze an occasional city into pretty poor terrain. The game performed flawlessly without any crashes or hiccups. Even alt tabbing out while writing my review was smooth and caused no issues. Another item to note is that AI turn times were fast. Even late game turns passed by in a matter of seconds. In Civ V I would guess turns can take 5 times as long. After rereading my review I seemed a little down on Pandora, but as a whole that isn't the case. Pandora: First Contact is a very solid 4X offering, following many of the conventions of the 4X genre but adding enough of its own touches to make it feel like its own game. Research and the tech tree are strengths for me, along with operations. Operations almost make me forget about the lack on wonders, but not quite. If Pandora could add more techs that weren't simple, improve economy / production / morale / etc by X amount, research would be even more interesting. And add some wonders! I enjoyed having to learn a different take on the typical growth / production model of 4X games. Growth in Pandora feels more natural than the accumulate food method. I do wish it was a little more sophisticated, perhaps tie morale into the growth equation and have more things affect morale. Living in a city that is attacked should lower morale. Who works as productively when the threat of invasion is looming overhead? The combat system is simple, but offers many combinations of forces with an easy to use unit designer. Because the designer is so easy to use it isn't a hassle to try and tailor your units to your intended targets. Most of my complaints come from either missing some of the 4X staple features, wishing some of the systems were made a little more complex, or pertaining to game balance. I've made a number of suggestions in the game's forum. The developers have stated they are in this for the long haul, so I think the game will get improved with time. I think all of its weaknesses are fixable and they have a very solid base from which to build on. Pandora: First Contact is easy to recommend now and may get even better. Edit 11/22/2013: I would like to add that I think the ability to produce wealth to obtain an economic victory is overpowered. Late in the game I was behind militarily. I moved most of my scientists to workers and produced wealth. I made 4-5% progress towards economic victory per turn. The AI continued to give me gifts even after I passed the 75% mark. 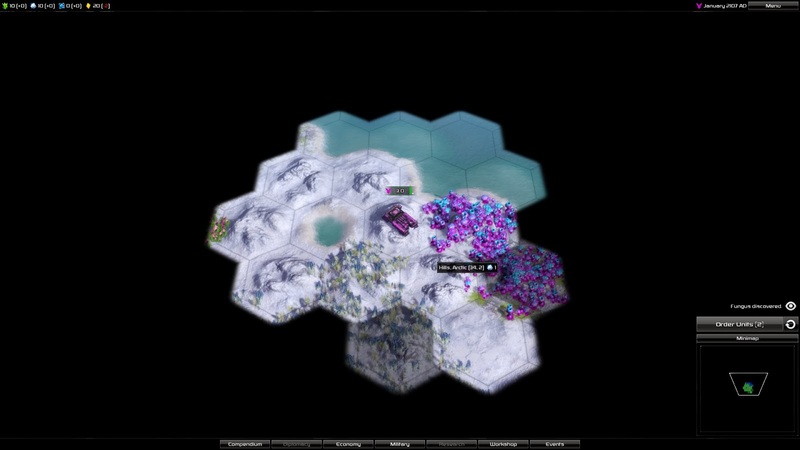 Since 1 faction had black hole generators, they may have been able to wipe me from the map if they had enough time to break the non aggression pact and wait for the cool down to expire. Nice review Rob. I believe city growth is also impacted by Morale. I'm pretty sure a high morale increases growth, possibly even as a migration from a low morale city. Thanks for commenting belouski. Morale only affects the production of farmers, miners, workers and scientists. It indirectly affects growth by migration as you mention. People move from cities of low morale to cities of high morale. I think the availability of housing has an effect on migration too. What I was suggesting is that morale also reduces the actual growth rate provided by the population. That way less new people get generated in a city with low morale, causing a net loss of total people in the faction (or at least slow down the growth). Migration doesn't cause a net loss in the faction's pop growth, it only affects where the population resides. Woops, you discussed morale a little later, but the way you worded the city growth paragraph led me to believe you weren't aware of it. Good review, agree with it mostly. I'm a lot higher on the Unit Customization overall, it let you take ownership of your faction's army in a way I don't think a lot of 4X games allow. The ability for even the humble Colonial Infantry to stay relevant (mostly as city garrisons and sniper support) deep into the mid-game with weapon and armor upgrades was a very nice side effect of it I felt. I'm glad for the options even if they mean that researching a new unit results in a an extra few decision-clicks as you bring their design up to speed in the Workshop. I tend to make a lot of permutations of each unit type. For mechs, I generally have a gun-attack device, gun defense device, missile-attack device, missle-defense device, laser-attack device, laser-defense device. I have those types of permutations with the other unit classes too, so it ends up being a lot of extra clicks. If they allowed me to just specify 'best laser' it would save me a lot. 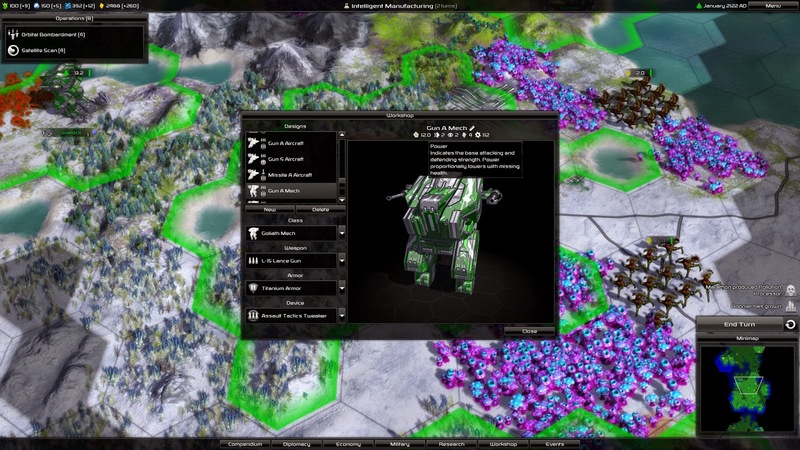 It is one of the better unit customization systems. I was going to check this game out as I'm a diehard fan of SMAC, but when I went to the game's website - no demo to download to draw in potential new customers. Mehhh...I guess this company isn't looking to get this out to the masses. I guess I'll have to wait for this to show up on The Pirate Bay to demo it. With the recent plague of indie studios putting out alpha and beta junk and demanding full-price, I don't buy anything unless I can demo it first. It's reasonable to only buy stuff with a demo, but I guess I still wouldn't get it through illegal means when it doesn't have a demo. Let's play videos on youtube are often good way to test if you like a game that does not have a demo. In some ways they are better and worse than a demo - on hand you get the experience of a expert player, but often that experience can paper over aspects you may find difficult. For example, I bought Distant Worlds based on Das24680's videos, but I find it difficult to play as I can not get a good handle on the economic side of things. The economic side which I often enjoy more than the military side of 4x is too abstract in Distant Worlds. Nevertheless it's a good game and I'll probably invest more time in it at some point. Same with Pandora. Interest is generated watching Das24680's recent videos. It looks like a good buy, but he's has a few crashes and he's only early game. So I'll wait see how it plays out for him. Ummm, watching someone else play it via a YouTube video is *not* a demo, and I think you know that. That would be like you wanting to buy a new car and instead of taking a demo drive, the salesman says that you are not allowed but he'll let you watch a video of someone else driving it. I'm certain you would not be buying that car from that salesman if he didn't let you test drive it first. We live in a world where it is a given that a potential buyer gets to try it first. You want to buy a home, you get to walk through the house - to touch it, feel it, experience it. Would you buy a house if the sales agent only let you flip through a picture book of that house? No. I have very little sympathy for companies that lose sales and market share - to whatever medium - because they have a narrow vision on how to best reach a potential customer. The programming for the game is already complete; just put in a limiter line in the coding and allow it to be played for 100 turns. Demos are very easy to put out but small studios and indie companies just get lazy in wanting to do it. I'm not ashamed to admit that I use TPB if a company refuses to put out a demo. And if I like it, I usually buy it - as long as they have it in the format I prefer to buy software in. In the end, software companies control their own fate when it comes to selling their products to a wide and diverse audience of consumers. Either they rise to the challenge or they don't. First, if you noticed I said I agreed that it is a reasonable position to take to only buy a game if you can try a demo first. There are a lot of bad games out there and it is easy to get burned if there is no demo. Also, even if I like a game there is no guarantee you will. I also wouldn't have sympathy for a company that loses sales because they don't have a demo. It is the consequences of a business decision they made. It isn't as simple as sticking in a line of code to limit turns. That would easily be cracked to remove the turn limit. Actually almost any solution will be cracked so maybe that is a moot point. Since you went the car / home analogy, I'll respond to that too. My guess is that if you went to buy a car and the dealer wouldn't let you take it for a test drive, you would walk out of that dealership and not give them your business. You wouldn't go back after hours and steal the car. As I said, if someone wants to go to TPB that is up to them. It's just not something that I do. I just noticed that your reply was to Unknown and not me. Thank you for an honest, well written review. Just a quick update, from my above post as the "diehard fan of SMAC". I finally got my hands on this game and...mehhh, it's a good start, but it has a ways to go to be the true 'spiritual successor' to SMAC. I'm glad a got a "demo" version of this first, because I would've been asking for my money back at $50 for this game (DVD, boxed version + shipping. I don't rent games from Steam). If I could retitle this game, I'd call it "SMAC Lite". It has a lot of nice eye candy with improved graphics, a nice soundtrack and fluid gameplay, but it is lacking in depth. I'm an 'old-school' gamer and the bar is set high for me when companies try to do a remake of a classic game. As I mentioned previously, and my suspicions have been confirmed, definitely find a site where you can 'demo' this first before you shell out $50. Unfortunately, knowing how Matrix does business, they will attempt to milk this a much as they can. More than likely, they will put out a couple of expansion packs (charging you for them, of course) to add the missing features back into the game that should've been there at initial launch. Bottom line, if you're looking for something that is a true successor to SMAC, you will be disappointed with this as it lacks the depth and fun complexity of the original. I agree that it can use a bit more meat on its bones. I still had fun with it as it gave me a new 4X to play, but Civ IV is still my favorite. Thanks! I don't put out a high volume of reviews, but hopefully some will be of use to you.